We have had a little infestation of spiders in our apartment in Brooklyn. We went to Ireland for the summer and came home to unruly spiders. The bites itch me but my wife has a terrible reaction to them. I was able to finally catch a juvenile and photograph it. 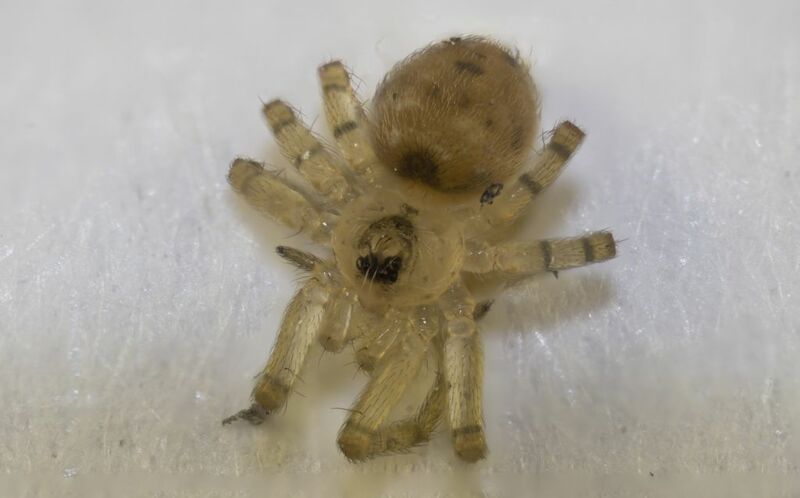 I don't exactly know how the spider/s got into your apartment, but the specimen you show appears to be a juvenile "Flatmesh Weaver" belonging to Oecobiidae family. Though normally found in more southerly parts of North America ( only eight species north of Mexico) they can be found commonly in buildings. As to the "infestation" of spiders, if so it would be because in your long absence various insects have settled inside and provided a food source for spiders. The reason the spiders would be indoors. If I am correct in identification, the Oecobiidae spiders specialize in ants though do eat other insects and are not know to bite humans. The spiders have no reason to bite humans (even if a small species such as this could) and my guess is some other invertebrate has set up house and is causing the itching/bites you describe. If you want to confirm or inquire more information ( I could be wrong, been know to happen!) you might check in with the American Museum of Natural History in New York, and ask for Louis Sorkin, curator of arachnids . I really don't believe the spider is the problem.